There is demand for JAMK graduates: they have the know-how, the right kind of attitude and pride for their professional skills. Being a professional offers you more choices in life and career. Get a practically oriented Bachelor's degree and start your own international career in Jyväskylä, Finland. The degrees consist of 210–240 credits. Their standard completion time varies from 3.5 to 4 years. The application time for Bachelor’s Degree Programmes conducted in English is in 9 – 23 January 2019. 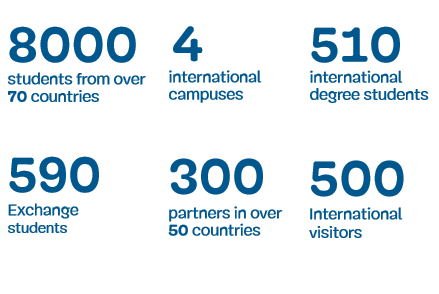 At JAMK University of Applied Sciences, we have more than 8,500 students from over 70 countries. The facilities at JAMK combine a relaxed atmosphere with high technology. Our international students report that the teaching is excellent and our staff are very supportive. Our graduates have the knowledge and skills to succeed in the global working environment. Jyväskylä has four beautiful seasons ranging from warm green summers to crisp white winters. The city is located in Central Finland and is surrounded by numerous beautiful lakes and scenic nature. Both Finland and Jyväskylä are safe places to study and live. Jyväskylä is very dynamic. Take a look at the sports and cultural activities, not to mention restaurants and cafés!